America’s military is the most educated, best trained, and highly motivated fighting force the world has ever seen. Those men and women transitioning from the military are a great national resource who can make a huge difference to any organization that has dedicated itself to hiring outstanding military veterans. At Forward March Incorporated, we understand the true value of those who have served and we are dedicated to teaching companies how to attract, hire, and retain high quality veteran employees. 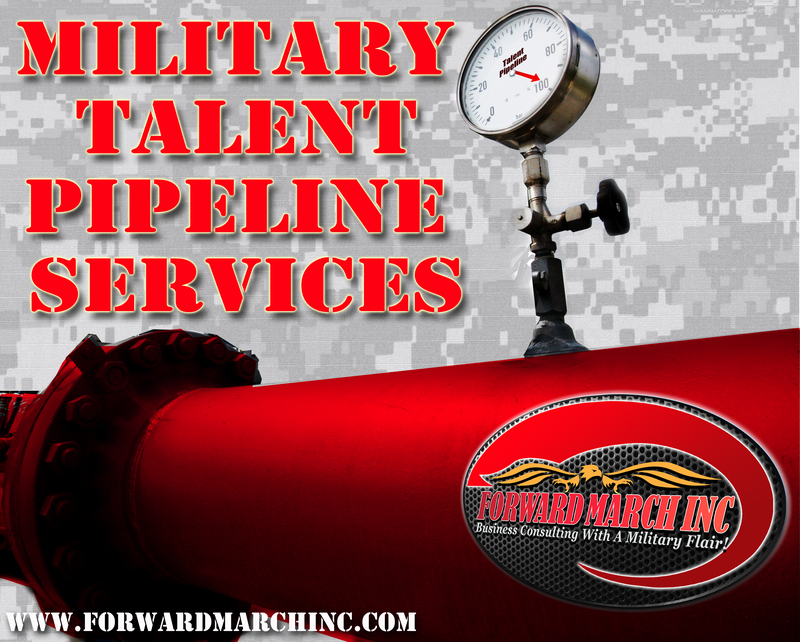 While we are not a staffing company, one of the many ways we accomplish this is through military pipeline development. So what’s the difference between staffing and a talent pipeline? Staffing is the process of recruiting and hiring personnel with a specific set of skill sets, for a specific position within an organization. Doing this requires a dedicated team of recruiters and hiring managers who understand the exact and immediate hiring needs of the company. For the most part, organizations do a good job of filling positions as new requirements open up, but forecasting staffing requirements proves far more difficult. It’s not always clear what future staffing requirements will be down the road. Predicting future staffing requirements requires forward thinking on behalf of hiring managers. They must account for turnover, promotions, expansions, reductions, and a myriad of other factors that impact staffing needs. Talent pipeline, on the other hand, provides companies with a pool of qualified candidates ready to fill critical positions as they become available. A robust talent pipeline ensures the right person is placed in the right position at the right time. Utilizing a talent pipeline is a great way for organizations to adapt to changing staff needs. A talent pipeline allows recruiters to focus on the here and now, while giving hiring managers the peace of mind knowing that the candidate pool can be turned off and on as personnel needs evolve. FMI’s unique approach to a military talent pipeline allows us to continuously sell your organization as a great place for veterans to work. Most important of all, FMI is committed to providing our talent services free of charge to the veteran work force. Regardless of your manpower needs, let FMI fill your organization with hard working, loyal, and well trained American veterans. This entry was posted in Employer Resources and tagged affordable, careers, customized, employees, employment, forward march inc, hire, hiring, hiring our heroes, HR, human resources, jobs, labor, management, military talent, military talent solutions, pipeline, san antonio, staffing, texas, transitioning military, veteran culture, veterans by Forward March Inc. Bookmark the permalink.